* Note: this piece was originally posted in Religion in American History. When people label religion “evil,” they almost always include Jonestown, Aum Shinrikyo and the Branch Davidians (who are represented here in an image accompanying Blake’s article). The common assumption follows that these religious groups can be marked as evil because they are imbricated in violence, death and destruction. We can cluck our tongues sympathetically at the supposedly brainwashed people deluded into joining these movements, and we can rest easier at night by assuming that our religious commitments must be the safe kind. Moreover, we can hold onto the vision of “healthy religion” that [John] Blake espouses. If only we were versed in these four signs, the argument goes, then maybe these tragedies wouldn’t happen. If only it were this easy. Such an understanding of “evil” religion is predicated on a sense that religion is inherently “good.” Blake even writes that “religion is supposed to be a force of good,” as if claiming this aloud necessarily makes it so. Unsurprisingly, I am increasingly wary of labels like “good,” “healthy,” “authentic,” “bad,” “evil,” or “illegitimate” when they function as modifiers for religion. The normative bounds of how we wish the world is/was present themselves in such labels. Yet, what does that do for analysis? I have spent much of my career thinking about how assumptions about religion and religious people guide our narratives. Villainy, as I tell my students, might make a good story, but it does not provide analysis. To claim the “evilness” of some religions marks others as safe and good, and in both instances, it ignores the sheer ambiguity and ambivalence of that thing we call religion. We lose something with every normative claim. Chidester writes, “I have tried to recover a sense of humanity of the people who died in Jonestown” (xvii-xviii). 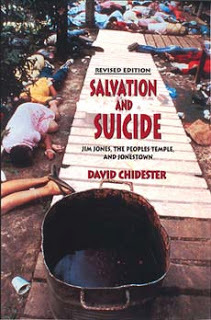 Rather than provide another caricature of Jim Jones or Jonestown, Salvation and Suicide provides a more complicated portrait of the lives and deaths of 913 people in the Guyana jungle. No easy labeling of “evil” or “good” appear in its pages. Instead, we are left with haunting images of corpses littering the ground without easy explanations as to why. His book, then, works against dehumanization of the Jonestown dead in media coverage, scholarship, and public perception. To do this, he relies upon Ninian Smart’s concept of “structured empathy,” which is empathy structured by categories like symbol, myth, classification, orientation, and ritual that allows engagement with the worldview of another (xiv). I find this concept compelling as I employed it in my work on the Klan, but it is also unsettling. What might it mean to engage Jonestown or the Klan empathetically? What do we gain by emphasizing the humanity of our historical actors? What kind of scholars are we if we ignore their humanity? This question, in particular, appears and reappears in every research project of mine. I can’t escape it, nor do I want to. Perhaps I have taken the method of “structured empathy” to the breaking point here. However, if I had to push this brief observation on method a step further, I would argue that the method of structured empathy is already a moral strategy. It requires the recognition of the irreducible humanity of others upon which any ethics of the interpretation of otherness must be based (xv). To recognize the “irreducible humanity of others,” on the surface, appears not to be a radical claim, but it is. Chidester’s careful reconstruction of the worldview of Peoples Temple represents the allure and appeal of a utopian commune in Guyana, in which members could escape the dehumanizing forces of American life, capitalism and racism, and remake themselves. Chidester demonstrates how suicide became a choice of being human or becoming subhuman. In the end, the Jonestown dead emerge as both. In heartbreaking detail, he guides us through the last moments that result in mass suicide, a choice of humanity, and the resulting interpretations of the event that make the Peoples Temple subhuman again. Finding humanity is not always an uplifting journey or a tale of liberation. Sometimes, finding humanity means confronting violence, terror, and death. We can be left haunted rather than inspired. Kelly J. Baker is the author of Gospel According to the Klan: The KKK’s Appeal to Protestant America (Kansas 2011), which employs the 1920s Ku Klux Klan as a case study to explore the intersection of Protestantism, nationalism, whiteness and gender. Her recent work includes articles on the Klan’s robes and fiery crosses as material religion, “Rapture readiness” in contemporary Christian apocalypticism and zombie apocalypses in contemporary film and literature. In addition to these commitments, Kelly is also an editor of the Religion in American History blog and co-editor of the Bulletin for the Study of Religion. This entry was posted in Kelly J. Baker, Religion and Society, Religion and Theory, Theory and Method and tagged Aum Shinrikyo, Branch Davidians, David Chidester, evil, Jonestown, Ku Klux Klan. Bookmark the permalink.